From manufacturing to warehousing, assembly, quality control and delivery, make sure your products are delivered to customers in mint condition. Northrich offers cost-effective protective packaging solutions to safeguard your products. The ANGLEGUARDTM and the STRAP GUARD are designed to provide easy application and removal and so to maximize worker productivity and substantially reduce product damage. The ANGLEGUARDTM is an excellent edge protector for windows and doors. 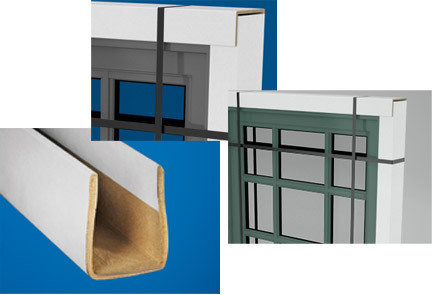 It comes in a variety of widths to meet a wide range of protective packaging requirements. Shipping and storing windows and doors represent unique challenges. It is important to reduce the risk of damage not only during transportation and storage but also in transit to the customer location. The edge protector is precisely designed to protect the edges of shaped windows and doors to reduce product damage and minimize replacement cost. The ANGLEGUARDTM and STRAP GUARD are cheap and easy to install, and it can be stapled to the window frame or combined with other custom products to prevent strapping damage and protect corner edges. Most Northrich products are made of recycled materials. Protect the environment through recycling our products.